Some of the cast of "Amos". It was one of the first movies I ever saw that focused on seniors issues – aging, elder abuse, independence . 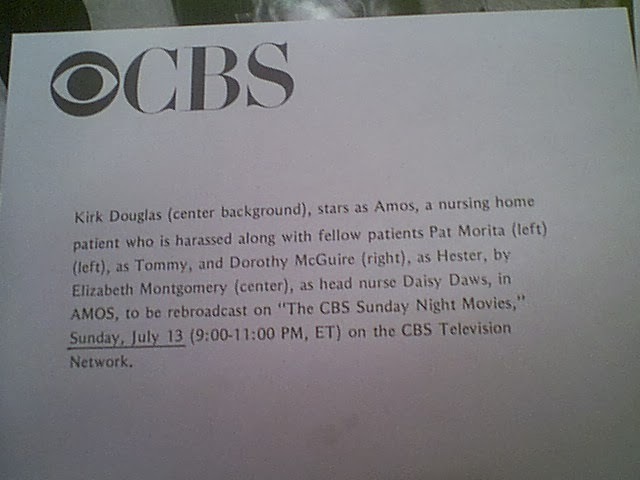 “Amos” used a brilliant cast, ultimately earning Kirk Douglas an Emmy nomination. Amos Lasher is a one-time baseball manager who loses his wife and home in an accident, confining home to a state-run nursing home. That’s when the fun really begins. The home is a sterile place where everyone lives in fear of Daisy Daws, the nurse who runs the place with an iron fist. 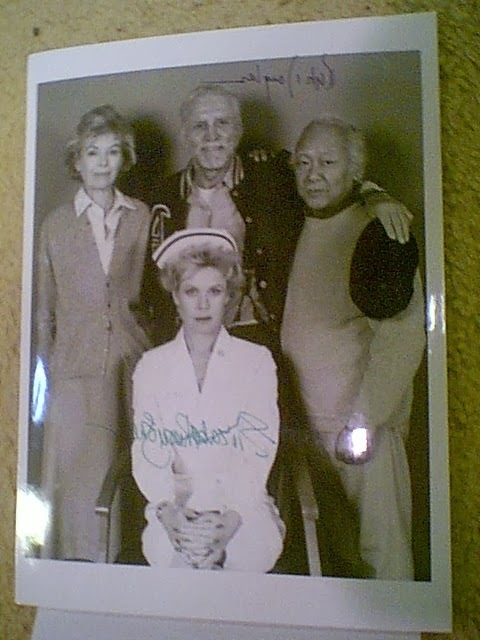 Elizabeth Montgomery turns in a brilliant performance as the wicked, ruthless, condescending nurse who does whatever she wants to keep the residents in line and, if memory serves, bilk them out of their estates. If they are really uncontrollable, somehow they always end up dead too. Her performance is a complete about face from her long-time role as Samantha Stevens, the kind, sweet, charming witch on Bewitched. Here, she’s more like the wicked step-sister. The caption for the photo above. Nurse Daisy, however, will meet her match in Amos Lasher, whose indomitable spirit will not be squashed. He is assigned to a room with Ray Walston, who gives Amos the name Chuck. It is the same name he gives all his roommates, after his very first one. Chuck died but his name lives on in all who come after him. No use getting to know them when they’ll be gone in no time. He also meets Tommy Tanaka, played by Noriyuki “Pat” Morita, fresh off his Academy Award nominated turn in “The Karate Kid”. Tommy has a love for gardening, but he has to hide his plants from the staff. When they discover one, they take it away. The home is very much a police state. Soon, Amos meets Hester Farrell, played by movie starlet Dorothy McGuire, who eventually falls in love with him. Blockbuster calls this movie melodramatic, but I whole-heartedly disagree. The ending is anything but predictable or melodramatic, although I won’t spoil it for you because I have embedded the movie in its entirety in this post. Beyond its dramatic quality, “Amos” shines a light on the plight of the elderly. We are all destined to get old, but not at the expense of our dignity, self-respect, or grace. “Amos” showed just how we, as society, abdicate our responsibility to care for those who once cared for us. It shows that instead of helping people age gracefully, we warehouse them, and treat them as a burden or an expense to the bottom line of life. But it also shows that, just because we age, we don’t die. We have the same desires, needs, and expectations we always did. And you try to take those away, we won’t go down without a fight. Long before concepts like “aging in place” became the vogue, we needed movies to show us what happens when we stop respecting our elders. Not many people will remember “Amos”, but it did its part to change the world and, maybe just maybe, it opened a few eyes along the way.